With up to 4 seconds of delay, which is more than most studio processors, your creativeness will have no limits! The DigiDelay pedal gives you 7 different types of delay to choose from which include tape, modulated, reverse, and a looper that will allow for an infinite amount of 4 second layers. Don't settle for sub-par craftsmanship or limited options in a pedal. 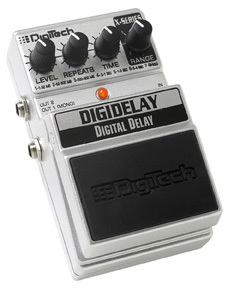 Go for quality and go with DigiTech. This rugged metal chassis will stand the test of time and offers further options like dual mono and stereo outputs as well as switchable cabinet modeling. My X-Series pedal goes through batteries quickly. Is this normal? The X-Series pedals consume batteries at a tremendous rate. 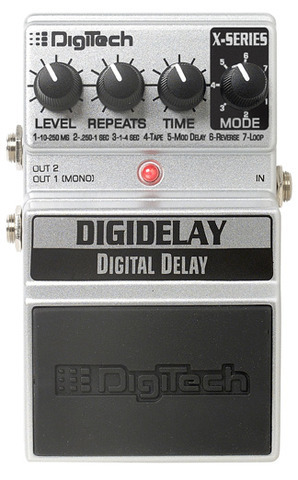 For longest battery life, we suggest fresh, high quality ALKALINE batteries, or the the PS200R power supply available from our Outlet Store at http://outlet.digitech.com.